This 300 years old Acacia tree in vast desolate Ténéré region of the Sahara desert, Nigeria, named by the French as 'Arbre du Ténéré' (Tree of Ténéré), was once the only tree in the large expanse of desert. There was no tree in the nearby area for another 200 kilometres. For decades it held the distinction of the remotest tree in on the Earth. Visible from a large distance in vast Saharan plain it used to act as a landmark in the desert for the traders/travellers travelling through the area. 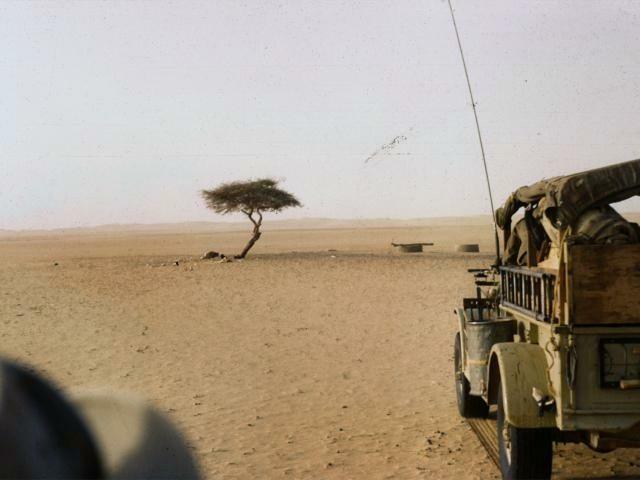 Around 1938–1939 French army men started searching for water near it on the premise that existence of this tree indicated presence of water underneath. A dig near the tree revealed that the roots of the tree had actually reached upto the water table about 33–36 meters below the surface. A well was therefore established near the tree. Alas in 1973 some truck driver crashed into the tree and damaged it to the death. Some say that the driver was drunk and as ill luck would have it, he hit the only object in the vast expanse. Some say it was frustration of lonely driver who purposely knocked down the tree. However the end result was same and the tree didn't survive the crash and the remaining part of the trunk withered away. Later at the very spot where the tree stood, some unknown artist created a metal tree from pipes, used tyres and empty drum, as a monument to the dead tree. Thus the location still acts as a landmark.